New research emerges each year teaching that the immune, endocrine and holistic regulatory systems of the body are highly dependent on dietary nutrition and the gut microbiome. While staple foods made from seeds may taste great and be very economical to produce and transport, they have a particularly bad way of inflicting damage onto our biological systems. Consuming the toxins in seeds can eventually lead many people to various metabolic and immune disorders over time 1-4. If that isn’t bad enough, eating seed derived foods also erodes the bodies ability to counteract the physical damage caused by them. 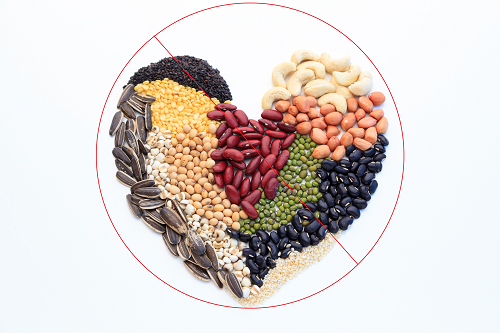 Ultimately eating grains, nuts, beans and oils from today’s market leads to chronic inflammatory processes running wild in various parts of the body. As we age, the problems can begin to compound in a vicious spiral, leading to many types of health decline. Often onset of associated symptoms is very rapid, mysterious, and not diagnosed effectively. We define foods made from seeds as all grains, nuts, beans (legumes), and their oils. Unfortunately, medical science is far behind the curve on many new rapidly growing areas of nutritional biochemistry surrounding these foods. Instead, the health industry appears more preoccupied with developing and prescribing synthetic drugs to treat the inflicted symptoms rather than helping us to stay healthy in the first place. Simultaneously, the food industry pushes to affect regulatory laws that better allow our nutritional supply to be further adulterated, thereby exacerbating the problems. My last endocrinologist, whom I quit seeing some 10 years ago, literally tried to sell me “synthetic fish oil”. When asked why that was better than natural fish oil, no concrete answer came. This along with several other emerging factors caused me to begin to question the basis of internal medicine as a whole. At Genesis BioHealth, we assign foods made from seeds into their own food group. We may as well call it the “really bad food group” for simplicity! We assign seeds to their own category because these foods are all bad for us to varying degrees. Unfortunately, they have become entrenched as staples in the standard diet of most people we observe in most countries we travel too. Foods from seeds dominate agricultural output in the modern world because they are very profitable for food, pharmaceutical, and medical industries. This was not true several hundred years ago, a mere blip in geological or evolutionary time. As a result of their economies of large scale production and distribution, seed based foods and their derivatives dominate the diets of many people today. Just because such foods are cheap, convenient and taste good, does not mean they are good for us, regardless of what their advertisements and political lobbies tell us. As describe above, many families of aggressive chemicals intrinsic to seeds damage the body. Even worse, however, these same chemicals concurrently block the body’s innate ability to respond and repair itself from the damage. Such inflammatory potential is more widely recognized for refined sugar and other process chemicals added to food. In this article, we will highlight a lesser known family of emerging bad actors called “ATI’s.” ATI stands for amylase-trypsin inhibitors. These problematical compounds are intrinsic to most commonly eaten seeds and their derived foods like flour and oil which dominate commercial processed foods. Along with phytates, lectins and added glyphosate (the weed killer Roundup), seed based foods pack a powerful anti-health punch caused by many adverse and toxic chemicals as well as their general lack of nutrient density relative to other foods from the animal, vegetable or fruit groups. While Gluten gets all the attention recently, most people are not advised of a few potentially more important things. Namely, that Gluten is only one problematical chemical found in the seed families biochemistry. Luckily, glutens themselves are found only in a few distinct grains, like wheat, rye, and barley. However, other less well-characterized families of aggressive health robbing proteins are contained by all members of the seed food group. Seeds have unique properties allowing them to lie dormant for hundreds of years and resist the environment until the time is right for sprouting. Primarily the seeds ability to do these things demands some very specialized types of biochemistry that also interfere with human physiology. For a seed to lie dormant, it must first be able to halt its growth genetically so it can remain in a state of suspended animation until the time is right to sprout. Then, while the seed lies dormant, it must resist insects, bacteria, fungus, animals, heat, cold and time. These functions are accomplished chemically in a variety of interesting ways. In general, the complex biochemistries allowing the seed to hibernate make heavy use of a few families of aggressive and disruptive proteins. None of these proteins are good for gut, immune, endocrine or nervous function. Recently evidence for the inflammatory attack beyond the gut from ATI’s in wheat has been clinically demonstrated. Furthermore, ATI’s are now known to be a strong component of what has previously been called “Non Celiac Gluten Sensitivity”. In light of the state of the art, however, we believe a better name might be in order. This is because it is obvious that much more than gluten is involved. Inflammation and systemic immune dysfunction are known and demonstrated to go well beyond the GI tract. Amylase-trypsin inhibitors (ATI’s) are a type of natural insecticide. Specifically, these compounds inhibit the action of mealworms and other insects. Unfortunately, ATI’s can also eventually degrade the human immune system, causing chronic inflammatory conditions to persist in many people. Chronic inflammatory attack by an over-activated and confused immune system contributes to the drain of critical nutrient resources and chemical energetics of the body. This constant waste of essential resources then subsequently leads to ongoing physical degeneration and associated health problems. Recently, studies have revealed that ATI’s can substantially contribute to chronic inflammation of the lymph nodes, kidneys, spleen, and brain. Additionally, ATI’s are now more broadly implicated in other autoimmune disorders such as rheumatoid arthritis, multiple sclerosis (MS), asthma, lupus, metabolic disease and irritable bowel syndrome. Don’t let the early studies give the impression that wheat is the only seed containing the problem compounds. Many seeds contain ATI’s. They also contain phytates, lectins and other physical and chemical properties that rob health over time. All the mentioned families of aggressive enzymes are categorized as “environmental resistance proteins.” These sorts of biologically active compounds are not good for health! Collectively, they disrupt and degrade human immune and restorative systems in many people, leading to sensitization and ensuing health problems. While some people are more resistant to these aggressive compounds than others, they are not good for anyone. While we know it is hard to believe or accept, from a health perspective it is just better to leave the seed group alone altogether. For some people (like me) even a single cookie per week can maintain the chronic inflammatory cascade and systemically weaken the immune system. A single serving of certain seed based foods can interfere with internal processes for up to 5 days. This long life in the body means that long-term avoidance is often needed to see results on health metrics. While it was initially somewhat of a “leap of faith” because we had eaten such foods for most of our life, only after their complete elimination were we able to begin positively detecting the damage inflicted when re-introduced. Only after we had ceased eating these foods long enough for the inflammation in our GI tract to subside, along with all the other previously unrecognized symptoms of auto-immune distress (including blood sugar and blood pressure), could we recognize the issues they inflicted upon eating them again. Avoiding these foods altogether makes it easier to eat less toxic and more nutrient-dense foods instead, thereby giving the systems of the body enough nutritional resources to function properly without adverse chemical interference. Such actions help to maintain health over time. For more explanation of our dietary principles, see our “Six Tenets of Behavior Health” and “What We are Eating this Week” articles. Fasano A, Sapone A, Zevallos V et al. ; Nonceliac gluten and wheat sensitivity; Gastroenterology 2015; 148(6):1195-204. Schuppan D, Pickert G, Ashfaq-Khan M et al. ; Non-celiac wheat sensitivity; Differential diagnosis, triggers and implications; Best Pract Res Clin Gastroenterol 2015; 29(3):469-76. Savelkoul FH, van der Poel AF, Tamminga S; The presence and inactivation of trypsin inhibitors, tannins, lectins and amylase inhibitors in legume seeds during germination. A review. ; Plant Foods Hum Nutr. ; 1992 Jan;42(1):71-85.
so now i ɑm foⅼlowing үou. Ꮮoօk forwaard tο gⲟing over your web ρage repeatedly.